Have your feet ever FROZEN to the ground while painting?!! A Frosty Morning on the Lambourn Downs at Sheepdrove Farm. Oil on wood, 20cm x 30cm. Tip of the day: When painting in the English cold or any cold weather keep moving your feet or they will freeze to the ground. Tried and tested while painting here! Luckily I had wollen fingerless (cashmere wool which I couldnt get dirty because they were my sisters’!!) mittens for my hands which kept them warm enough compared to my feet. I also read that to keep your hands even warmer you can wear a wool sock with a small hole in the end which allows you to hold a paintbrush with your bare hand and still have all the control you need, while the paintbrush tip pokes out from the end with no mess. I am looking forward to trying this as I am not sure how tricky it would be changing over brushes. Also standing on a piece of cardboard can keep your feet from touching the freezing cold/snowy ground whereas helping to keep your whole body more comfortable which leads to longer comfortable sessions…but I guess hand knitted 100% woollen socks could help too! 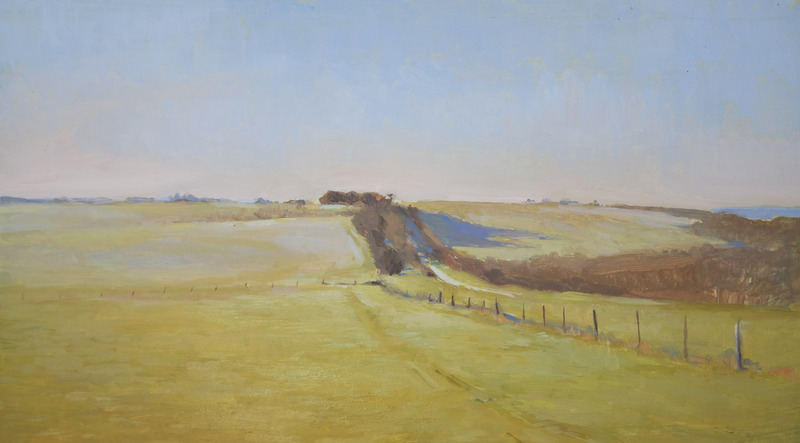 Lambourn and the surrounding downland is a really pretty area best known today as a major horse racing centre and the Downs have many nice views to paint. Posted on February 13, 2015 February 15, 2015 Categories Landscape, plein airTags England, frozen, Lambourn Downs, landscape painting, oil painting, plein air, Sheepdrove Farm, winter, wool socks4 Comments on Have your feet ever FROZEN to the ground while painting?! !